The Art of Brooklyn Film Festival was, in short, quite wonderful. Their claim is that it’s run by Brooklyn filmmakers for Brooklyn filmmakers, and they deliver. The screenings were organized into blocks that made sense, the pairing of shorts and features worked well, the communication between the festival staff and the directors and producers was great… and the overall atmosphere was joyous. Cast, crew, fans, staff, and industry folk mingled pretty freely, both during the pre-screening receptions and at the nightly after-parties. It was, of course, great to be able to commute to a festival as opposed to taking trains, buses planes, and automobiles. But the venues themselves were also easy to get to by subway and a lot of care was taken to make sure the projection and sound quality were up to par. So, here are a few really quick ‘snapshots’ of the films I saw. There wasn’t a bad one in the bunch, but I’m trying to write this quickly and I didn’t get to everything, so I apologize in advance if I don’t mention a few films (hopefully I get a little more time to write a follow-up piece). The first set of films I saw were part of a shorts block on Wednesday, May 7th. These things are often a very mixed bag, with one or two standouts and a very pretty terrible pieces, or others that simply don’t relate thematically to each other very well. So imagine my surprise when every damn short worked well and flowed naturally into the next one. One of the qualities all the shorts had was their restraint. There wasn’t an extraneous line of dialog, an out-of-place trick shot, or a distractingly flamboyant performance in the bunch. The show/tell ratio was perfect in all of them. Inquietude (directed by Morgan Davidsen): This was a really tense short film about a dancer who’s at a particular crossroads – she’s broke, desperate for a break, losing both her apartment and maybe even her mind. There are only a handful of lines of dialog in the whole film. Unlike flashy crap like Black Swan, you really feel for the character. Fun fact: the film was shot several years ago but the audio was lost and had to be recreated. Perhaps this lends something to the sparseness of the film as well? Without Fire (directed by Eliza McNitt): A single mother and her daughter struggle with poverty, no heat and little hope on a Navajo reservation house in the middle of the desert. But the girl has an idea about how to get heat… The director, cast, and crew did an amazing job of conveying the depths of the story, the stakes, the resourcefulness, all with a bare minimum of flash, some great music and sound design, and terrific performances. An Honorable Man (directed by Harrison P. Crown and William G. Utley): This won the best short award, and for good reason. A cynical, older priest shows up to give a eulogy, but no one’s showed up for the funeral. If this sounds like a downer, I assure you it isn’t. It’s funny, tragic, wonderful, and hangs entirely off a few well-placed camera moves and the priest’s performance. The next block I saw was on Thursday night just before the Found In Time screening. Again, a wonderful selection of films – that all fit well together – so I’ll just mention a few here. Armed Defense (directed by Irina Patkanian) is a mysterious, quiet short. A man walks into a house – is it his? We don’t know – and he’s not talking. He starts arming himself, setting up defenses. Against what? It’s a great film because it doesn’t supply all the answers, but perfect captures a mood. Kosmodrome (directed by Youcef Mahmoudi) was the definition of trippy. It’s a story about a young psychic woman who’s being brainwashed by a another psychic (working for the KGB) to kill the head of NASA. It’s got a ton of ideas and somehow captures the its subject perfectly. I’d love to see a feature version of this. Found In Time was part of a sci-fi block that started later that night, that included two well-done shorts, The Dahl House (directed by Jason Markowitz and Zac Grant)and Hole (directed by Brian McCann). The Dahl House is about a family that seems to be living in an underground bunker. But the son is having trouble making friends. Can dad help him out? It’s a Walt Disney meets Twilight Zone film. This was really well-made – it’s inventive, shows rather than tells, and has a great twist. It also features some really nice performances and has a great, lo-fi look to it. Hole is about a young, rational, realistic guy who suddenly finds himself in the middle of either a quirky string of coincidences or a web of interconnected, suspicious events. It’s another film that shows rather than tells, has some understated, winning performances, and is really well shot and edited. Both of these films treat the audience like adults, and the filmmakers were a lot of fun to hang out with as well. I wish them a lot of luck on the festival circuit! After three days of film watching, networking, and hitting up the after-parties, I had to take a break. But we came back to hit up the “Dark Side” screening block. Indigo (directed by John Hawthorne Smith) was a really great tragic thriller. Eli Casey is an up-and-coming photographer, happy husband and father, and recovering heroin addict. When his son is kidnapped, his whole life falls apart, and his old habits start getting the better of him. He tries to battle both his inner demons and figure out the mystery of his son’s disappearance. This is a heavy film, but NOT a downer. It’s a well-acted, well-directed film, takes its time, doesn’t try to rush the scenes, and builds up the dread. This has to be one of the best fests that we’ve been to, in terms of the quality of the films, the dedication of the staff, and the good vibe of the fans and fellow filmmakers. Can’t wait to come back next year and soak in the films as an audience member! 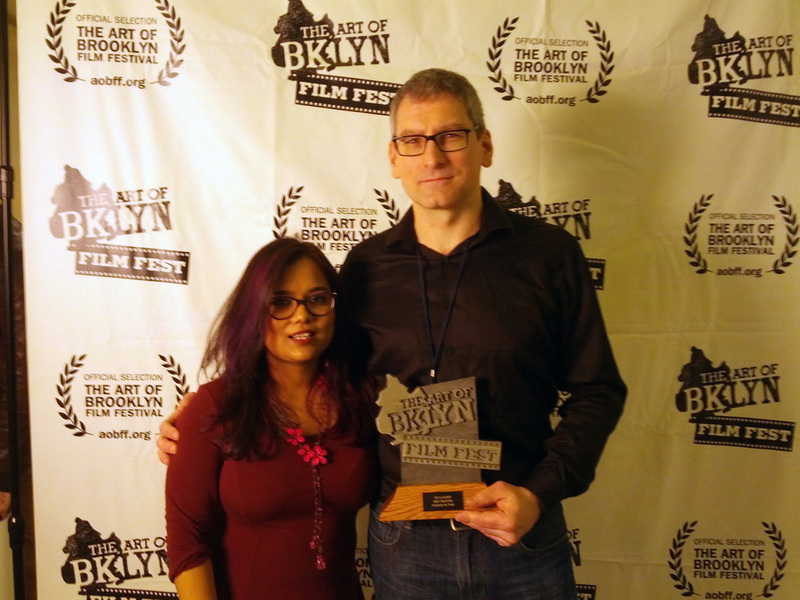 This entry was posted in Uncategorized and tagged AOBFF, Art of Brooklyn Film Festival, awards, Festivals, film, Film festivals, Found In Time, sci-fi by admin. Bookmark the permalink.